In 2001 two groups independently identified a family of novel G-protein coupled receptors some of which appeared to selectively respond to trace amines [3,4], thus providing a viable target for previously observed responses. As other members of this new receptor family were subsequently identified, a number of potential nomenclatures appeared in the literature. Recently, three proposals for a systematic naming system for this family of receptors have been provided [6,9,10]. The International Union of Pharmacology nomenclature  has only officially named one of the receptors, TAAR1. The nomenclatures of Lindemann  and Hussain  vary only in that Hussain includes the recently identified large expansion of TAAR seen in teleosts. This inclusion resulted in a modification in the classification of TAAR sub-classes previously proposed by Lindemann and colleagues  (Table 1). Figure 1. Structures of trace amines and the corresponding neurotransmitters. *Number of genes identifies the total number of genes, including pseudogenes, identified in all vertebrate species so far studied. The proposed nomenclature  for these isoforms is given in parentheses. Note that not all isoforms of a given receptor are necessarily present in all species, while some of the isoforms may be pseudogenes in some species but remain functional in others. For example, with TAAR7 there is a single TAAR7 pseudogene in the human and opossum genomes which is distinct from the TAAR7a-i variants found in rat and mouse genomes. TAAR7c is a pseudogene in mice, while TAAR7f and TAAR7i are pseudogenes in rat. There are no functional or pseudogene variants of TAAR7g-i in the mouse genome. more comprehensive phylogenetic analysis recently published consolidated TAAR into 3 sub-classes, the third of which is restricted to teleosts . This teleost specific sub-class has not been studied further, and will not be discussed in detail in this chapter. Here we will use this sub-classification scheme proposed by Hussain  since it is based on the most comprehensive phylogenetic analysis yet conducted. TAAR, which warrant brief mention. With respect to mammalian species, all so far examined in detail appear to express at least one functional receptor from each of sub-classes I and II [6,7,9]. Interestingly there is a much greater divergence of TAAR between closely related species, than is seen with other G-protein coupled receptor families, with a number of pseudogenes present in various species (Table 2) [6,9,12-17]. This has formed part of the basis of suggestions that TAAR are a rapidly evolving family of receptors, that may be involved in species-specific adaptive responses [6,9,15]. As will be detailed later, recent functional studies also appear consistent with this hypothesis for at least some of the TAARs. The teleost specific sub-class III shows a very pronounced and remarkable expansion of TAAR isoforms [9,12], with upwards of 75% of teleost TAAR belonging to sub-class III . For example, the zebrafish genome contains at least 97  and possibly up to 119  TAAR genes, of which between 57 and 112 [9,12,15] are thought to be functional; there are 48-64 TAAR genes in the stickleback genome, of which at least 48 appear to be functional [9,12]. This compares to the 15 functional genes plus one pseudogene seen in the mouse genome [6,9,12]. The opossum genome contains the greatest number of genes of any mammalian species so far studied with 19-22 functional TAAR and 3 possible pseudogenes [9,12,16]. The human genome consists of 6 functional TAAR with an additional 3 pseudogenes [6,9], although others only reported 5 functional TAAR [11,12]. Many of the additional TAAR genes found in teleosts appear to be species specific [9,17], and it has been hypothesized that these may form the basis of species-specific chemical communication, whether at the levels of reproductive pheromones or other social interactions [12,17]. Further, while TAAR are tightly clustered within an individual chromosome for mammalian and avian species [6,9,12,14], they are widely dispersed across multiple chromosomes in teleosts [9,12]. In addition, teleost sub-class III TAAR have seen multiple intron insertion and deletion events [9,12]. The complete coding sequence of all other TAAR is contained within a single exon with the exception of TAAR2, the gene for which contains one intron [6,12]. Sub-class I TAAR consist of TAAR1, 10, 11, 21 and 27 [9,12] and includes one of only two receptors (TAAR1) shown to respond to classical trace amines [3,4,6,18]. Consequently TAAR1 is by far the most fully characterised of the TAAR. Earlier classifications based only on TAAR1-9 included TAAR2-4 in the same sub-family as TAAR1 , but these have subsequently been moved into sub-class II . TAAR genes . TAAR1 appears to be coupled to the Gas G-protein, with a stimulation of adenylate cyclase and accumulation of cAMP observed following receptor activation [3,4,6,19,20]. Interestingly TAAR1 does not appear to be membrane inserted in standard expression systems, with the expressed receptor remaining intracellular [3,4,6]. Although two N-terminal N-glycosylation sites have been identified , the lack of membrane insertion may relate to the absence of an additional consensus glycosylation site in the N-terminal region of the full length TAAR1 . Thus, despite containing 7 putative transmembrane domains, TAAR1 appears to be primarily expressed in the cytosol. PE and TA are the most potent of the traditional trace amines as agonists at TAAR1, showing sub-micromolar EC50 values [3-6,22,23]. It should be noted that affinity at TAAR1 shows species dependence, human and mouse TAAR1 showing higher affinity for PE than TA, whereas rat TAAR1 shows a higher affinity for TA [3,6,22,23]. Species dependence is also seen with the affinity of tryptamine, with considerably lower affinity seen at human TAAR1 than either the rat or mouse TAAR1 [3,6,22,23]. 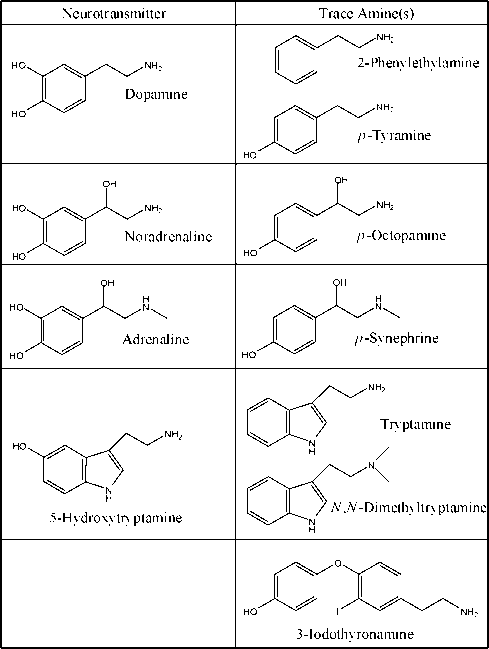 Octopamine, synephrine and dopamine generally show 50-100 fold lower affinity, while 5-HT has an approximately 1000fold lower affinity [3,6,22,23]. Interestingly, when N-terminal glycosylation sites were added to allow membrane insertion, the affinity of octopamine and tryptamine for human TAAR1 was increased  compared to that seen in previous studies [3,6,23]. The affinity of TA however remained unchanged [3,6,21,23]. Whether this relates to the ability of ligands to cross cell membranes and interact with the intracellular receptor requires confirmation. It was previously reported that PE and TA release was dependent solely on tissue levels, and was not activity dependent [24,25]. This was taken as indicative of PE and TA crossing cell membranes by simple diffusion. Indeed PE and TA are the most lipophilic of the biogenic amines . We have recently begun modelling the energetics of protonated PE (the physiologically relevant form) crossing sphingomyelin lipid bilayers. Our preliminary data suggests that relatively small amounts of PE will diffuse across this lipid bilayer . If confirmed this low level of penetrance raises the possibility that transport processes other than simple diffusion, presumably some form of facilitated diffusion such as trace amine 'leak' channels, may be involved. A number of other endogenous compounds have also been shown to interact with high affinity with TAAR1. The O-methyl metabolites of dopamine, noradrenaline and adrenaline have all been shown to activate TAAR1 at low to sub-micromolar concentrations [4,22]. More recently TAAR1 has been shown to be potently activated by metabolites of thyroid hormone [20,28,29]. In particular, 3-iodothyronamine (Figure 1) has been shown to activate TAAR1 with an EC50 value of approximately 10-30nM [28,29], 10-fold more potent than either PE or TA. Further, the endogenous hallucinogen, N,N-dimethyltryptamine (DMT) (Figure 1) fully activates TAAR1 at a concentration of 1^M  which compares favourably with the recently described affinity of DMT for the o1-opioid receptor . Thus, there is good functional evidence for the inclusion of such endogenous amines in the class of trace amines. As will be described later, a number of psychotomimetic drugs and drugs of abuse also show a high affinity for TAAR1. TAAR1 mRNA and protein have been localised throughout the brain in mice [3,31], rats , rhesus monkey [19,32] and human , primarily associated with catecholaminergic and serotonergic cell bodies and projection areas. In addition TAAR1 has been localised to a number of peripheral tissues including heart , pancreas [4,34], leucocytes [35,36], gastrointestinal tract [3,37], liver, kidney, lung, spleen, prostate gland, skeletal muscle, and stomach . TAARi is the only TAAR which appears not to function as an olfactory receptor in mammalian species [i8] or in teleosts . However, it was recently reported that adult, but not larval, Xenopus laevis express TAARi in both the olfactory organ and brain . A number of non-endogenous compounds have also been shown to interact potently with TAARi. Of particular note is the agonist activity at TAARi of a number of drugs of abuse. Both d- and l- isomers of amphetamine and methamphetamine have been shown to activate TAARi with EC50 values in the low to sub-micromolar region [4,22,39,40]. Importantly, this concentration corresponds well with plasma levels seen following acute administration in humans . Similarly, 3,4-methylenedioxymethamphetamine (MDMA; 'ecstasy') [4,21], dihydroergotamine and LSD  are all agonists at TAARi with low micromolar potency. Thus, TAARi provides a novel site through which some of the effects of such drugs of abuse may be manifest. Given the observed in vivo effects of physiological concentrations of trace amines (see later) it is interesting to note that drugs of abuse have been reported to sensitize noradrenergic and serotonergic neurons independent of dopamine releasing effects [4i]. TAAR would seem an attractive putative site for the mediation of such effects. In addition, this range of ligands has allowed the determination of receptor residues involved in ligand interactions at TAARi [29,42], and the subsequent site-directed synthesis of increased potency agonists, based on both PE and 3-iodothyronamine . This group has also described the first putative antagonists of TAARi . Trace amines have long been implicated in a number of neuropsychiatry disorders . This again received renewed interest following the discovery of TAAR. In humans all TAAR are located within a narrow region of chromosome 6q23 [3,4,6]. This is close to a well documented susceptibility locus for schizophrenia [44-48], which maps particularly close to the TAAR6 gene [6,7]. TAARi knockout mice have recently been developed [3i,49] and proposed as a novel model for schizophrenia . Such animals are largely normal in appearance and behaviour but show deficits in pre-pulse inhibition and increased sensitivity to d-amphetamine administration [8,3i,49]. Such effects are regarded as indicative of an animal model of schizophrenia. There have however, been no reports directly linking TAARi to schizophrenia. Putative metabolites of the anti-arrhythmia drug amiodarone were recently reported to be TAARi agonists , raising the possibility that TAARi may be involved in either the therapeutic or adverse effects of amiodarone. However, it has subsequently been reported that in contrast to rodent TAARi, human TAARi is not activated by amiodarone metabolites [50a]. With the exception of one study identifying the presence of TAAR genes in various species, the other members of sub-class I TAAR have not been studied. TAARi0, TAARi0a-d and TAARii gene expression have been identified in zebrafish, where they were all expressed in distinct neurons of the olfactory epithelium, with the exception of TAARi0c which was only identified in embryos . The TAARi0 isoform may be a pseudogene in zebrafish . TAAR2ia-c and TAAR27 were identified in the stickleback genome, while the medaka and fugu genomes contained TAAR21a-f . The fugu genome also encoded TAAR27. In contrast the tetraodon genome contained a number of TAAR27 isoforms (a-f) along with TAAR21a-c .
Sub-class II TAAR consist of the remaining mammalian TAAR (2-9) along with TAAR12 and 13 . Besides TAAR1, TAAR4 is the only other receptor at which cognate ligands have been conclusively demonstrated. A variety of species specific paralogs of TAAR7 and TAAR8 have been identified . In humans, there is no functional TAAR7 gene, and a single functional TAAR8 . Interestingly TAAR7, TAAR8 and TAAR9 are all pseudogenes in the chimpanzee . Neither TAAR2 nor TAAR3 have been studied in detail. While both are functionally expressed in rat, mouse and cow [3,6,9,12,13,18,36,51], TAAR3 is a pseudogene in human and non-human primates [6,9]. TAAR2 is also a pseudogene in the chimpanzee, but appears to be functional in humans [6,9]. The endogenous ligands at these two receptors are not known. A nonsense mutation in TAAR2 showing higher prevalence in patients with schizophrenia has been reported , although no replication studies appear to be present. A functional TAAR2 ortholog has also been identified in chicken [9,14] and frog . In contrast, Hashiguchi and Nishida  failed to identify a TAAR2 gene in the frog genome. Similar to the situation with TAAR1, TAAR2 was also identified in the elephant shark  suggesting this is the evolutionary origin of other sub-class II TAAR in jawed vertebrates. Both TAAR2 and TAAR3 are expressed in distinct sub-sets of olfactory neurons in the mouse olfactory epithelium, co-expressed with Gaolf [12,18] and coupled to an accumulation of cAMP. TAAR2 is also expressed in low levels in olfactory neurons of the Grueneberg ganglion of embryonic, but not adult mice . TAAR2 expression was reported in the olfactory organ of both larval and adult Xenopus laevis, while expression in the brain was only seen in adults . TAAR2 and 3 expression have also been reported in mouse cardiac tissue  and B-cells . TAAR3 was shown to be activated strongly by several primary amines, including isoamylamine, which is enriched in male versus female mouse urine, and has been suggested to act as a pheromone . As stated, TAAR4 is the only other receptor at which a cognate ligand has been conclusively demonstrated. Both rat and mouse TAAR4 have been shown to respond to PE [3,18] at low micromolar concentrations and tryptamine at approximately ten-fold higher concentrations . As with TAAR1, TAAR4 appears to be coupled to cAMP accumulation via Gas . The human ortholog of TAAR4 is a pseudogene, previously identified as the 5HT4 pseudogene [3,6]. A single, functional, TAAR4 gene has been identified in the cow genome . Two isoforms of TAAR4 (TAAR4a and 4b) were reported to be present in the clawed frog (Xenopus tropicalis) genome , while Hashiguchi and Nishida  also identified multiple TAAR4 isoforms in the frog genome. Similar to TAAR2, TAAR4 has been shown to be expressed in distinct olfactory neurons of the olfactory epithelium [12,18], in embryonic but not adult olfactory neurons of the Grueneberg ganglion , in cardiac tissue  and B-cells  of mice. Beyond expression in the olfactory system, the tissue distribution of TAAR2-4 has not been systematically determined. TAAR5 was previously identified as the human PNR (Putative Neurotransmitter Receptor) gene [3,6]. In the initial description of the identification of this gene, RNA transcripts were identified primarily in skeletal muscle of humans, with lower levels found in the amygdala, hippocampus, caudate nucleus, thalamus and hypothalamus . A weak signal was also identified in the substantia nigra . Expression in the kidney has also been reported . Thus, the distribution of TAAR5 in the brain has similarities to that of TAAR1. Although expression levels in mouse olfactory epithelium were lower than other TAAR, mouse TAAR5 was shown to be activated by sexually mature male mouse urine , suggesting that it may function as an olfactory receptor. Specifically, mouse TAAR5 appears to respond to tertiary amines (although not primary, secondary or quarternary), including trimethylamine  which is enriched in sexually mature, male mouse urine. In addition, a second tertiary amine, N-methylpiperidine, also activated TAAR5 . In this respect it would be interesting to determine the affinity of the endogenous tertiary amine, N,N-dimethyltryptamine for TAAR5. TAAR5 expression has also been observed in distinct neurons of embryonic although not adult Grueneberg ganglion . Functional TAAR5 has also been reported in the rat [6,9], opossum [9,12], chicken [9,12,14] and bovine  genomes. Human TAAR6 expression has been detected in the amygdala, hippocampus and kidney . Particular interest has been paid to human TAAR6 as the SCZD5 schizophrenia susceptibility locus  was reported to correlate specifically with polymorphisms of TAAR6 . Confirmatory linkages between TAAR6 and schizophrenia and possibly bipolar disorder have subsequently been reported [55-59], although others have reported marginal or no linkage [60-66]. The lack of a consistent replication of TAAR6 linkage to schizophrenia may be a function of one or more factors including disease heterogeneity, ethnic variation of populations studied and the apparent high mutation (rapidly evolving) rate of TAAR . TAAR6 has been reported to be prominently expressed in distinct neurons within the mouse olfactory epithelium [18,51] and Grueneberg ganglion . Although TAAR6 expression could be detected in both adult and embryonic Grueneberg ganglion cells, there was a pronounced reduction in the number of cells expressing TAAR6 during development . Interestingly olfactory neuron dysfunction was recently reported to occur in schizophrenia . TAAR6 would appear to provide a possible unifying explanation for the association of olfactory dysfunction with schizophrenia, although this requires specific investigation. Functional TAAR6 genes have been identified in a number of other mammalian species, with 6 isoforms present in the opossum genome, two in bovine genome and a single TAAR6 gene in the rat . As previously stated, while TAAR7 appears to represent the major site of TAAR gene expansion in mammals, there is no functional human or chimpanzee variant [6,9]. It has been proposed that this may represent the decreased importance of olfactory cues in primates . While there is a single TAAR7 pseudogene in the human and chimpanzee genomes, the rat genome contains 7 functional TAAR7 isoforms with a further 2 pseudogenes, and the mouse genome has 5 functional TAAR7 variants with an additional pseudogene [6,9,12]. Interestingly several of these isoforms appear to be species specific, with no murine form of the rat TAAR7g, TAAR7h or TAAR7i (pseudogene) variants present [6,9]. Further while TAAR7f is functional in mouse, it is a pseudogene in rat, while the reverse applies to the TAAR7c isoform [6,9]. In addition, the putative ligand binding properties of the TAAR7 isoforms show pronounced differences between rat and mouse . The human and chimpanzee TAAR7 pseudogenes appear to be most closely related to the rat TAAR7h . Further, while other primate pseudogenes are relatively well conserved in comparison to their rodent orthologs, the TAAR7 pseudogene has largely degenerated . Again, this would appear consistent with a decreased reliance on olfactory behavioural cues in primates in comparison to other species. Interestingly, the opossum genome, which contains an expanded TAAR6 gene repertoire, does not appear to contain either functional or pseudogene TAAR7 variants . TAAR7a-c genes were identified in the cow genome . Hashiguchi and Nishida  reported that all mouse TAAR7 variants were expressed in the olfactory epithelium. Probes for TAAR7d, 7e and 7f were shown to hybridize to distinct neuronal populations in the olfactory epithelium , although as discussed by the authors the ability of these probes to maintain specificity for the closely related TAAR7 variants is questionable. This expression co-localised with Gaoif expression, again suggesting that these receptors function as olfactory receptors via coupling to cAMP accumulation . Expression of TAAR7a and TAAR7d, but not other TAAR7 isoforms, has also been reported to occur in distinct populations of cells in the Grueneberg ganglion from both adult and embryonic mice . As seen before, there was a pronounced decrease in expression during development to adulthood. The TAAR7f mouse isoform was shown to be activated by N-methylpiperidine, although not by a second tertiary amine, trimethylamine . Similar to TAAR7, isoforms of the TAAR8 receptor have been identified in rat, mouse and cow genomes [6,9,12]. Both rat and mouse genomes contain three functional TAAR8 genes (TAAR8a, TAAR8b and TAAR8c) [6,9]. A single functional TAAR8 gene is present in the human genome, although similar to the situation with TAAR2, the chimpanzee TAAR8 is a pseudogene . As seen with TAAR7, the opossum genome does not contain any TAAR8 genes . TAAR8a and 8b were identified in the cow genome . Alternative start codons for the rat isoforms were reported with only the codon leading to the shorter transcript conserved in mice and humans . The human TAAR8 was suggested to be most similar to mouse TAAR8b and rat TAAR8a , suggesting that it is a distinct isoform. While TAAR8 expression was observed in the olfactory epithelium [12,18], this was at a lower level than seen with other TAAR . No expression of any TAAR8 isoform was detected in post-natal mouse Grueneberg ganglion . TAAR8a expression was found to be the most abundant TAAR in rat cardiac tissue . TAAR8 mRNAs were also found to be expressed in mouse B-cells . Human TAAR8 mRNA was detected in the kidney , amygdala [3,5] and hippocampus . 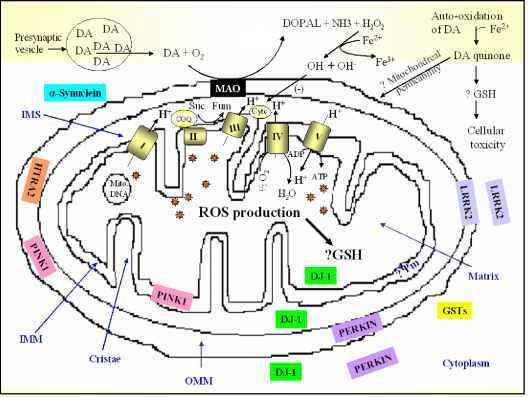 There have been no ligands directly demonstrated to interact with any TAAR8 isoform at present, although it was suggested that the cardiac effects of 3-iodothyronamine were a function of an interaction with TAAR8a . A single functional TAAR9 gene has been identified in mouse, rat, cow and human genomes [6,7,9], although one study failed to identify a human TAAR9 gene . The opossum genome contains 7 TAAR9 genes (TAAR9, TAAR9a-f) . The chimpanzee TAAR9 gene however, is a pseudogene . Thus, the human genome contains 3 sub-class II TAAR genes (TAAR2, 8 and 9) that are not functional in the chimpanzee. On this basis it has been suggested that these may represent loci for diseases that uniquely affect humans , possibly including cardiovascular disease and the major psychoses . A single nucleotide mutation of TAAR9 resulting in premature termination and a presumed non-functional receptor has been identified in humans , though it is not associated with a disease phenotype, and the prevalence of the mutation was found to be the same among control, attention deficit disorder and bipolar populations. In humans TAAR9 was reported to be located particularly to the pituitary gland, although its expression could not be detected in a variety of other brain regions . Peripherally, TAAR9 expression was only identified in skeletal muscle by one group  and only in kidney and no brain regions by another . Nelson and co-workers  reported detection of TAAR9 mRNA in mouse B-cells. As with other sub-class II TAAR, TAAR9 was found in distinct neurons in the mouse olfactory epithelium where expression co-localises with Gaoif expression . No expression of TAAR9 was found in cells of the Grueneberg ganglion . At least one zebrafish TAAR9 ortholog has been reported, with expression predominant in the olfactory epithelium , although this was not detected by others [9,12]. As with TAAR8, no ligands for TAAR9 have yet been identified. Beyond identification of their genes in zebrafish , there have been no studies concerning TAAR12 and 13. Thirteen TAAR12 isoforms were identified, all of which were expressed in the olfactory epithelium and brain with the exception of TAAR12i, TAAR12l and TAAR12m, which were only detected in the olfactory epithelium . For TAAR13, 5 isoforms were identified which were restricted to expression in the brain, with the exception of TAAR13d which was only found in embryos . Zebrafish TAAR genes which appear consistent with sub-class II TAAR were also reported by Hashiguchi and Nishida . It seems likely that these correlate with the subsequent TAAR12 and 13 designations. At least one of these was expressed in the olfactory organ .